In middle age Pablo Picasso became enraptured by Marie-Thérèse Walter, a young woman he had met on a Parisian street. The Art Channel visits Tate Modern’s exhibition to understand how Marie-Thérèse became Picasso’s muse. How did his infatuation for her inspire his art? Grace Adam and Joshua White investigate why Picasso’s images of 1932 are challenging and unforgettable. My new film for The Art Channel is now online. Grace Adam and I visit the exciting exhibition ‘Alexander Calder: Performing Sculpture’ at Tate Modern to learn how he developed the ‘Mobile’ and moving abstract sculpture. A small black ‘quadrilateral’ on a white ground is the prelude to this survey of geometric abstraction over 100 years. A variant of Malevich’s notorious ‘Black Square’ first painted in 1913, this is a small example of a series he exhibited at the last Futurist exhibition in St Petersburg during 1915. Contemporary photographs illustrate these radical paintings clustered in the corner of a room. This simple gesture had revolutionary implications for abstraction. While overtly geometric this quadrilateral or rectangle marks the end of representation and a year zero for painting. It alludes to symmetrical perfection but remains constructed with imperfect lines as any object made with a hand and brush must be. As Malevich broke all the rules of Western art, he initiated a new era of possibilities, for this ‘full stop’ or void indicated that the conventions of tradition no longer applied. He was proposing an entirely new experience of painting we now describe as ‘Modernism’. Kandinsky in Germany was simultaneously developing a pure abstraction but his painting remained attached to painterly brushwork ,guided by intuition rather than pre-meditation. Malevich took art into a dead-end, only to break through the obstruction to the other side. Whether we can enjoy a transcendent or ‘Suprematist’ experience in the post-Modern age, within a noisy gallery in the middle of central London is a question that must be a subjective response. Spirituality in art is now satirised rather than validated. What follows in this rambling and rather confusing exhibition is a walk through many variations of geometric abstraction. 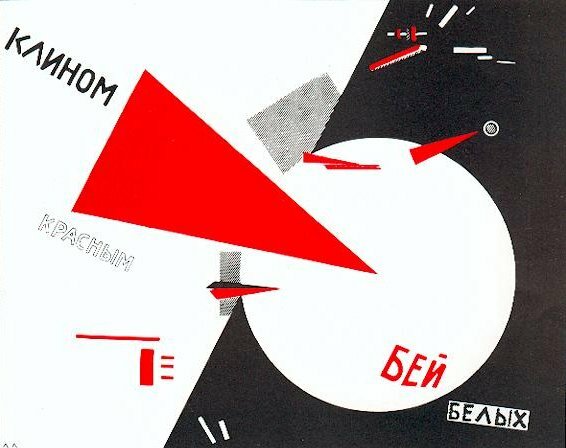 On the ground floor, the Utopian impulse is illustrated by Mondrian, Lissitzky and Moholy-Nagy. We jump from Constructivist magazines carrying graphic design guided by radical politics and geometric force lines to ‘Concrete’ art made by Lygia Pape and Helio Oiticica in Brazil demonstrating to engagement with abstraction beyond Europe and North America. As you head upstairs, the visitor walks over one of Carl André’s floor sculptures and past a Dan Flavin homage to Tatlin. Minimalism’s geometric rigour finds its roots in Malevich but denies his spiritual yearning. André and Flavin are brutally factual to the point of displacing the presence of the artist. Logic and materiality has triumphed over an art of political and spiritual aspiration. Without providing any sense of order, direction or interpretation beyond descriptions of individual works is a curatorial failure. We can link all of the pieces to some variation of geometry but even this certainty is lost on the top floor where the exhibition takes a turn to work largely made by living artists. Here there’s a distinct shift to post-modern doubt. Where Josef Albers’ Homage to the Square example had shown the conviction of geometric abstraction and its interest in colour, size, proportion and relational qualities well into the 1950s, we are left floundering with the later work. The works jump from Angela de la Cruz’s squashed canvases to one of Liam Gillick’s anodyne suspended panels above our heads crossing categories of furniture, architecture and art through to Keith Coventry’s deadpan, anonymous quotations of Modernist housing estate maps. Malevich’s geometric abstraction is now let loose from ideology and subjected to sceptical interrogation. Modernist Abstraction is viewed as exhausted and controlling. The curators even propose its complicity in colonialism with the inclusion of an indigo batik rug, ‘Blue to Black’ by Willem de Rooij, showing the hybrid way in which craft techniques were traded across the world and adopted by new societies. There is much to admire in this show, the scope and ambition. Individual pieces stand out for their confident and direct assertions. But the exhibition is crammed with too many artists confined to one exhibited work each. Whitechapel is simply too small to give this subject adequate attention. I could imagine this exhibition staged by the Tate or Royal Academy but at Whitechapel, the artworks are hemmed in and for the casual visitor it’s hard to understand how to view all this material and what conclusions to take away. It’s a case of wanting to cover too much and not finding enough structure. Two pieces in cloth neatly sum up this debate and would have made an ideal pairing. Anni Alber’s exuberant wall hanging develops a geometric grid of greens and greys developed by the weaving process rather than being a print imposed on the surface. On the top floor, the Mexican artist, Adrian Esparza, pulls a traditional shawl apart by unthreading it. The loose threads are then rewound around nails in the wall to create irredescent, geometric shapes which appear to be drawn against the supporting wall. Matching the indigenous with the mathematical, colour with construction, ‘Leadlight’ achieves a persuasive dialogue between rational structure and a cultural context, which Modernism effectively set aside. Instead of trying to produce an encyclopaedic survey of geometric abstraction, we need greater focus and precision to understand this story.